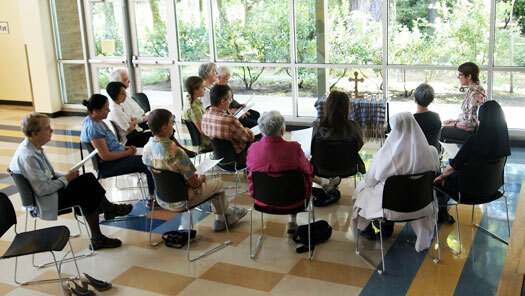 BEAVERTON — “Ways to Pray, a mini-seminar organized by members of the Leadership Conference of Women Religious, drew 55 people to the Sisters of St. Mary of Oregon campus on Sept. 13. The topics included contemplative prayer, presented by Holy Names Jane Hibbard; Taize prayer by Holy Names Sister Carol Higgins; Visio Divina by Karen Eifler; Ignatian Spirituality and scripture by Jesuit Father John Ridgeway; the rosary by Francisan Sister Guadalupe Jumarang; Icons by Monica McBride; and the Liturgy of the Hours by St. Mary Sister Adele Marie Altenhofen. The event was prompted by Pope Francis’ proclamation of 2015 as a “Year of Consecrated Life” and the U.S. Bishops’ suggestion to consecrated men and women to host an open house, organize service projects, and sponsor a day of prayer.